The family will greet friends starting at 10am. Marshall Community Foundation; 614 Homer Rd. Merrily Jane (Young) Lloyd of Traverse City, MI died December 25, 2016 after an extended struggle with cancer. Merrily was born in Albion, Michigan on November 6, 1948, the third daughter of Charles H. (Bob) and Verl (Marsh) Young of Albion, both deceased. 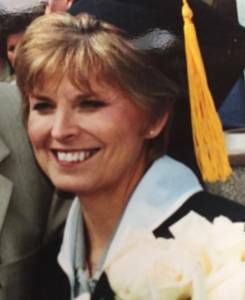 She graduated from Albion High School ’66 and from Central Michigan University with a degree in business. Following Central, Merrily was a flight attendant for North Central Airlines and then an office manager and administrative assistant for the Torrington, Timkin, and most recently, JTEKT Corporations in Plymouth, MI. Throughout her life, Merrily committed her time and efforts to making the lives of those around her more loving and more complete. A birthday or anniversary, graduation, disappointment, or tragedy did not go by unnoticed or unrecognized. Cards, personal notes, gifts, and chocolate chip cookies were constant acknowledgements from Merrily. Merrily is survived by her husband David Lloyd of Traverse City whom she married in 2014, a relationship that had begun when they were in the 7th grade. In addition, by her daughters Julie Nelson of Brighton, MI and Jamie Boertmann of White Lake, MI and her twin granddaughters Adelyn and Larkin Nelson. Merrily also is survived by her two step-sons Mitchell Lloyd of Brooklyn, NY and Tyler Lloyd and wife Shirin of Vienna, VA and by her three sisters: Marsha Whitestone and husband David of Traverse City, Cynthia Taber of Mt. Pleasant, Julie Peace and husband Tim of Mt. Pleasant and her brother Barry Young and wife Debbie of Champaign, IL. Preceding her in death was her first husband, Timothy C. Boertmann of Brighton. A memorial service will be held at the First United Methodist Church of Brighton, MI at 11am, Saturday, January 14, 2017; where the family will greet friends starting at 10am. The family has asked that contributions be made to the Merrily Jane Lloyd Scholarship Fund administered by the Marshall Community Foundation, 614 Homer Road, Marshall, MI 49068. Please visit www.lifestorytc.com to sign the guest book and share your thoughts and memories. Life Story Funeral Home, Traverse City, 231-941-9034.